← My appearance on WCCB TV! Thanks to a busy workload over the past few months, I’m way behind in my blogging on a variety of topics! I thought I’d start catching up first on my backlog of weird fiction, as I’ve been reading an immense amount in my evenings. A few months ago I blogged about The Great White Space (1974), a novel by author Basil Copper, recently reprinted by Valancourt Books. Basil Copper (1924-2013) was a stunningly prolific writer who penned a variety of novels and short stories in both detective and horror fiction. The Great White Space is Copper’s take on Lovecraftian cosmic horror, and I really enjoyed it; this, of course, led me to wonder if the rest of his work is just as good. 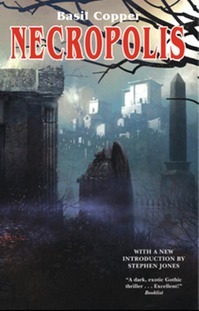 Fortunately, Valancourt Books has also released another of Copper’s novels, the compellingly-titled detective story Necropolis (1980). 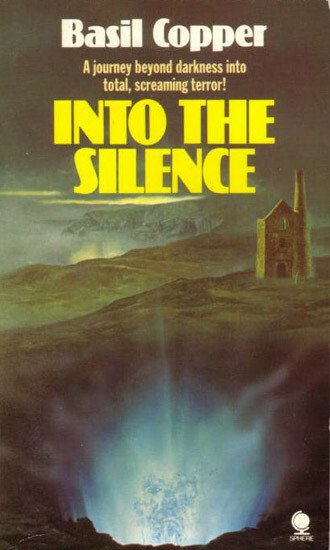 But I didn’t stop there — I also scared up one of Copper’s out-of-print books, the horror novel Into the Silence (1983). So what did I think? Neither of the novels was quite as spectacular as The Great White Space, but they are both enjoyable and worth reading. Necropolis is a fun gaslight-era London detective story in the style of Arthur Conan Doyle’s Sherlock Holmes tales. In fact, it is set in the same “universe” as Holmes, who is mentioned as a rival to the novel’s hero, private detective Clyde Beatty. As the story begins, Beatty is hired by wealthy young Angela Meredith to investigate the death of her father, which was ostensibly due to illness but Angela suspects has a much more sinister cause. Her father, a respected banker, had become uncharacteristically nervous and distant in the weeks before his demise. Though skeptical, Beatty looks into the matter, first questioning the late Mr. Meredith’s doctor and eventually ending up at the sprawling and sinister London Necropolis, Brookwood Cemetery. But will Beatty and his assistant Dotterell be able to solve the mystery before more people die — even Beatty himself? The best part about Necropolis is Copper’s use of one of the most macabre and unusual pieces of London’s history: the London Necropolis Railway. Between 1854 and 1941 a dedicated rail line led from London to the cemetery 23 miles distant. The train would carry the living and dead together to the appropriately-named terminus stops. Copper uses the train and the Necropolis itself as characters in their own right. Logo for the London Necropolis Railway, via Wikipedia. The story itself is enjoyable, albeit a bit slow-moving at times. Also, the mystery is not of the same caliber as those dealt with by Beatty’s rival Sherlock Holmes. I was able to figure out the “secret” quite early in the book, and I am not typically very good at solving mysteries. So I would call it a fun book, but not a spectacularly captivating one. So what about Into the Silence? It is a pure horror novel that bears some similarities with The Great White Space, as I note below. Into the Silence is a great exploration story that shares similarities with Copper’s earlier work The Great White Space. Both stories feature an obsessed academic pushing deep into forbidden territory in search of unspeakable secrets. However, the tone of the stories is quite different. Into the Silence exploits the fear of deep underground chambers, and as I’ve already noted, Copper does a great job of increasing the tension as the explorers go deeper and deeper. However, I did find the payoff to be a bit lacking. When the revelation comes, it is a bit disappointing, feeling almost like a bubble of tension bursting. Nevertheless, the book is well-worth reading for its eerie atmosphere, wonderfully-described underground horrors, and growing tension. If it’s any indication of what I think of Copper’s work, I’ve ordered several more of his books to read in the near future!